How does democracy work and which institutions are most crucial to its path to consolidation? Most scholars of paths to democratisation will meander around concepts such as: a) a strong and vibrant civil society, b) economic growth, c) free and fair elections, d) freedom of speech and press, e) political and economic independence from outside pressures. These are just examples of some the main requisites often argued to be crucial for the extension of democracy as ‘the only game in town’. Of course, this extension is not a linear path of progress, especially when it comes to post-socialist regimes, where the path resembles recessive cycles between authoritarianism and democracy. In some cases, such as Bulgaria, democracy is neither the only game in town, nor is there any strong desire by the citizens to play (in) it. The only actors involved in this game are elites, who have seemingly “managed to transform the pre-1989 totalitarian power into structures of oligarchic-political-economic power’ says Kalin Yanakiev, a lecturer of Philosophy at the Sofia University. Orchestrating democracy. Image:www.banitza.net. All rights reserved.The extent of the orchestration of democracy in Bulgaria reached a point of no return last June, when Delyan Peevski was elected Director of the National Security Agency (DANS). The focus on the figure of Peevski has unequivocally fallen on the fact he was instantly the “most recognisable face of brutal oligarchic power in Bulgaria”, says political scientist Valentin Ganev. However, what is important to note is not that Peevski is just a young media king-pin connected with overarching cliques of economic and political power. Rather, the real problem was that he was elected democratically and lawfully – one of the first legislative acts to be passed by prime minister Plamen Oresharski, after coming to power last May, was to alternate the law on DANS so as to allow the young, uneducated and highly inexperienced Peevski to become its Director. 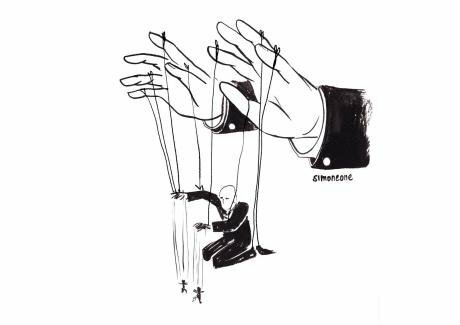 So, the election of Peevski burst open the script for running the country – the puppet-masters (the oligarchs) control the puppets (legislators, politicians, etc.) so as to transform the free and independent process of parliamentary elections, seemingly the core of democratic governance, into a game of ‘tag, you’re it’. The Bulgarian public was supposed to play the role of the passive audience of this fetishistic performance and remain apathetic. Thankfully, the long-lasting protests #ДАНСwithme (pronounced dance-with-me), which erupted immediately after Peevski’s nomination last year and lasted until the resignation of the coalition between the Socialist Party (BSP), the Freedom of Rights and Movements (DSP), claiming to represent Bulgaria’s Turkish minority, and their unspoken hero – the pseudo far-right and pro-Russia party “ATAKA”, disrupted the script by experimenting with the long-forgotten notion of (peaceful) civic anger. However, and unfortunately, it is not this civic anger that brought down the government this July. Rather, the resignation of the Oresharski cabinet pointed to a different kind of orchestration, extending beyond the borders of Bulgaria. South Stream, a highly controversial deal for the construction of a gas pipeline connecting Russia to Western Europe through Bulgaria, was the de facto trump card in bringing down the government. Oresharski received overwhelming and public criticism directly from President of the European Commission José Manuel Barroso for pursuing a project breaching European legislation. Regional development funds were temporarily frozen and a hawkish Republican delegation, headed by Sen. McCain was sent to Bulgaria to meet with Oresharski. The project was frozen, while friction within the coalition was growing and pressure from Russia was intensifying. The government collapsed in indecision as the connections between Russian influence, Bulgarian oligarchs and the stalled democratic process became more and more visible. Despite the establishment of an interim government, which vowed to officially discontinue workings on the project, news reports show that development continues nonetheless, with renewed investment and delivery of more than 8,000 pipes. In June, shortly after the announcement of the renewed freezing of South Stream, Bulgaria was faced with the biggest bank run since its devastating 1996-7 financial crisis. A run on CCB, which saw customers withdrawing one-fifth of the banks deposits, was followed by a run on First Investment Bank. CCB has remained closed and under government supervision since June 20. Over 200,000 depositors continue to wait for the unblocking of their deposits, as the current interim cabinet and the National Bank await a new government to decide how to solve the crisis. The formation of a centre-right or left-wing government will decide whether the bank will be bailed out, using billions of taxpayers’ money, or liquidated, securing only the repayment of deposits under 100,000 Euros. CCB is where a majority of the government money has been held since 2009. It is also the main creditor of the Peevski media empire. However, according to Bulgarian media, a growing confrontation between Peevski and CCB boss Tsvetan Vassilev was what caused the bank run. Both men are said to be involved in the building of South Stream, competing for Russian tenders, and that the panic in CCB was initially caused by Peevski’s withdrawal of funds from the bank. The second run on First Investment Bank was seen as a fabricated retaliation. The multi-levels of orchestration that have been revealed in Bulgaria in the past twelve months are both staggering and disheartening. It is not only the home-grown oligarchs controlling politicians and reaping havoc to the eroding democratic institutions. It is also, and this point cannot be underestimated, the severe and direct influence in domestic affairs by the Kremlin. Even though the protest movement inaugurated a powerful move towards a consolidation of a politically engaged citizenry, the extent of the pyramid seems too large, albeit unstable, to be dismantled from the bottom. This is the situation the country finds itself in ahead of the parliamentary elections on Sunday, October 5th: a) public distrust in democratic institutions and a drastically decreasing belief in the possibility of affecting change through participation and/or public protest, b) erosion of democracy from within by an increasingly isolated and unaccountable political elite, c) economic instability caused by the extent of and competition for oligarchic dominance, and d) severe pressure and extensive influence by Russia in Bulgarian politics. Is there any possibility of change ahead of the elections? Yes, but only if there is a high turnout at the polls. A high turnout can significantly reduce the growing numbers of corporate votes for parties such as DPS and populist newcomer Bulgaria Without Censorship (BBC), as recorded in the recent elections for the European Parliament. According to political scientists, Dimitar Dimitrov and Stoycho Stoev in the media outlet Dnevnik, those results showed a dramatic rise in the support for these parties in regions, where they have a weak representation. They argue that the only counter-balance is the politically active citizens to ‘engage’ their passive friends to go and vote. There is hope that a portion of this counter-balance can come from abroad, where an initiative by Bulgarian citizens living in foreign countries has seen a dramatic increase in size and accessibility of polling stations around the world. The activisation of diasporas abroad and the politically disenchanted within Bulgaria can bring about two important changes: 1) the formation of a centre-right reformist coalition between GERB, which according to the Alpha polling agency is looking at receiving around 36% of the vote, and the right-wing Reformation Bloc, expecting just under 6%, and 2) the marginal reinstatement of trust in the democratic process. It is important to note that overarching structural change cannot be expected overnight. The extent of the orchestrated nature of democracy in Bulgaria is deeply embedded. However, because of this level of unprecedented political crisis, it is possible to expect that, in order to survive, the next political power in government will be forced to change the name of the game. It therefore seems that the most-likely scenario in this highly lucrative contest will be the least of all evils, as proposed by a potential GERB-Reformation Bloc coalition.